If you haven't had a chance to review the Easy Start Guide for teachers, please click on this link to download a copy. You'll find these help pages for teacher websites much easier to follow if you've been through the guide. The default website for teacher accounts on School Loop Standard starts you off with a single page waiting for you to flesh it out a bit before publishing. The default page contains a number of elements. Any element you do not wish to keep may be removed by clicking the trash can icon for that element. If you delete an element and later change your mind, there's no need to worry. It's a snap to add more elements. Just click the the green + sign anywhere on the site that you want to add an element. If you'd like to change the layout, you may do so. We recommend, however, that you initially stick with the template at the top left with navigation on the left and 3 columns of content. This element allows you to post classroom notes for your students. Think of it as a classroom blog. The 10 most recent notes will appear on the page with the newest on top. A View All Notes link will appear on the bottom of the list if there are more than 10 notes. All notes remain on your site until you delete them. 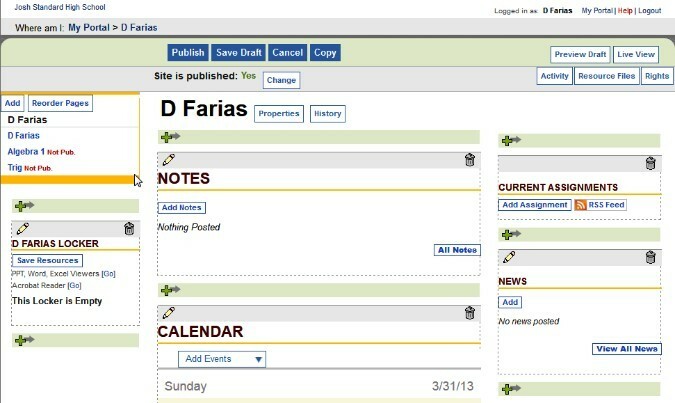 The calendar will display all the events you publish to your personal website, including assignments posted for your students. Click the pencil icon if you'd rather have a monthly calendar or any one of the 5 calendar options. The title is also editable. Use the Add Events menu on the calendar to publish either a general event (e.g. a class field trip) or an assignment. Any work currently assigned but not yet due will appear in this list. It is a convenient way for students to make sure they're on top of things. Publish important news for your class. Click the Add News button on the element and fill out the simple form. The newest items appear on the top of the list and expired news drops off automatically. Clicking the pencil icon allows you to choose how many news items will appear on the page and the format of the news ("Short" lists the headline only. "Long" displays the headline and up to the first few lines of text). So, you've deleted some elements from your default teacher page and added content to others. Perhaps you also posted some assignments, news, and notes. Are you ready to publish your site? Well, that's up to you. If you'd like to embellish the site in any way before opening it up to the public, then continue reading the other pages of this section. When you are ready, just click the Publish button near the top of the page. To change or view your Site Settings, click the Change button to the right of the "Site is published" option just above your name. In Settings you can change your site's Status as well as the access and display of your site.